Realogy, owner of several of the largest real estate brands, has reportedly invested in Estately, a listing portal that feeds referrals to agents. The investment highlights Realogy's growing focus on lead generation. NRT, Realogy's in-house brokerage, has said that it could collect a 35 percent referral fee for deals it sends to agents. The listing portal launched by Realogy's in-house brokerage has not gained traction. Realogy, the owner of several of the largest real estate brands and the largest brokerage, has made a strategic investment in Estately, a Seattle, Washington-based listing portal and brokerage that feeds buyers and sellers to real estate agents for referral fees. The investment — which wasn’t announced when it closed sometime earlier this year — underscores Realogy’s growing focus on harnessing technology to drum up business for its agents and comes as the listing portal launched by Realogy’s brokerage wing struggles to attract consumers. Realogy plans to use Estately to funnel clients to agents at NRT, Realogy’s brokerage wing, in exchange for referral fees, according to Realogy spokesman Mark Panus. Realogy’s investment in Estately has brought the reach of Realogy’s online ventures to a level that’s on par with Redfin and Homes.com, the fourth and fifth most popular listing portals. Realogy wouldn’t disclose financial terms of its investment in Estately, but public records seem to indicate that Realogy has thrown quite a bit of weight behind the startup. Three of the Estately’s board members are executives at NRT, which is the largest brokerage in the country. Estately didn’t immediately respond to a request for comment. In addition to NRT, Realogy also owns a number of major real estate franchisors, including Better Homes and Gardens, Century 21 and Coldwell Banker. Realogy’s bet on Estately marks its latest push into technology. Realogy bought ZipRealty for $166 million in 2014, while NRT — whose executives now make up a majority of Estately’s board — launched a national listing portal in February. Estately, ZipRealty and NRT’s listing portal, HomesForSale.com, all generate and pass off leads to agents, highlighting Realogy’s apparent focus on tapping the Internet to drum up business for its agents. NRT CEO Bruce Zipf has previously said that it could collect a referral fee of 35 percent on deals it feeds to agents through its lead-generation efforts. In those cases, the firm also would collect a commission split after that referral fee is taken off the top. Realogy appears to be planning to implement some version of this business strategy using Estately by directing leads generated by the listing portal to NRT agents. Panus declined to comment when asked whether Estately will continue to send referrals to non-NRT agents. Realogy’s investment in Estately may partly reflect the lackluster results of HomesForSale.com, which was intended to be a mainstay of Realogy’s online lead-generation strategy. Though launched in February to compete with leading listing portals, HomesForSale.com attracted just 5,671 visits in September, according to Experian Marketing Services’ Hitwise online intelligence tool. By snapping up a large stake in Estately, Realogy has gained access to a pool of consumers that dwarfs HomesForSale.com’s audience. Estately attracted 2.86 million visits, or 0.56 percent of all visits made to real estate websites, in September, according to Experian Marketing Services. 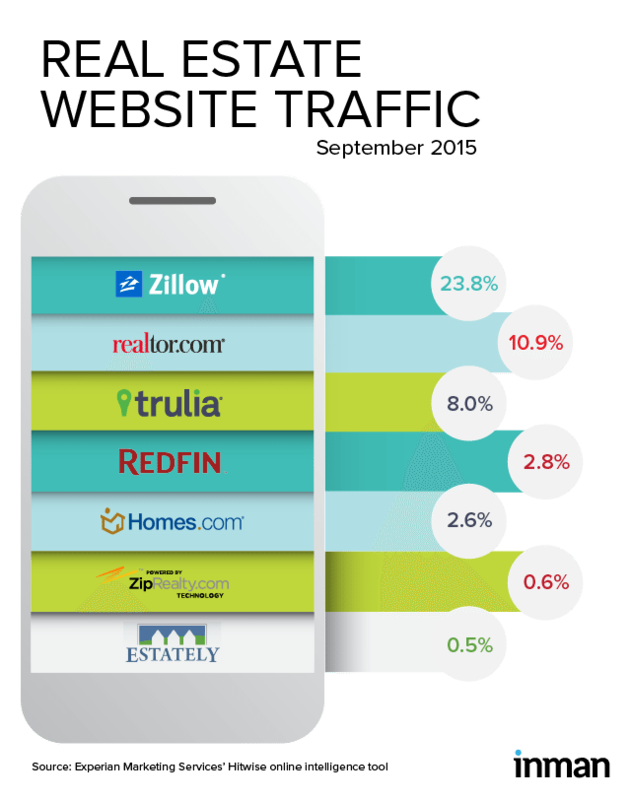 Through Estately and ZipRealty, which boasts 0.62 percent of all visits made to real estate sites, Realogy has access to 1.18 percent of all real estate site visits, according to Experian Marketing Services data. Add that to the visits to the national sites of Century 21 (0.68 percent) and Coldwell Banker (0.52 percent), two brands owned by Realogy, and Realogy’s share of real estate site visits rises to 2.38 percent. That pales in comparison to the eyeball share of the three most popular real estate sites — Zillow (23.85 percent), realtor.com (10.9 percent), and Trulia (8.02 percent) — but it’s comparable to the amount of traffic to the fourth and fifth most popular real estate websites, Redfin (2.8 percent) and Homes.com (2.64 percent). Realogy’s investment in Estately was first reported by GeekWire.